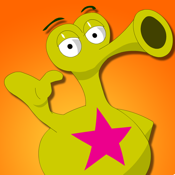 Children learn geometric shapes while tickling Giggle Spittle characters. Giggle Spittle Math Shapes consist of three types of engaging activities that will thrill your preschool child. • The Giggle Spittle Math Shapes are educational math games that teach children, from ages 2 to 5, to recognize, match and name simple geometric shapes. • Cute talking Giggle Spittle characters captivate children as they learn. • Your child is rewarded with whimsical worlds every time that they correctly match, or identify, shapes. • Your children hear the names and descriptions of shapes as they play. • No reading is required. Talking Giggle Spittles guide children throughout the game. Identify and Match -- Tickle the shapes on the Giggle Spittles and match all the shapes. Recognize Hidden Shapes -- Kids locate shapes hidden in zany environments. Learn Shape Names -- Listen to the Giggle Spittles and touch the correct shapes in order.